We have walked in your shoes, served in your rolesour principals have held key foodservice leadership positions at major convenience retailers. So, we understand how to help our clients develop and implement fresh food programs in venues that include made-to-order, packaged foods, beverages, and bakery. 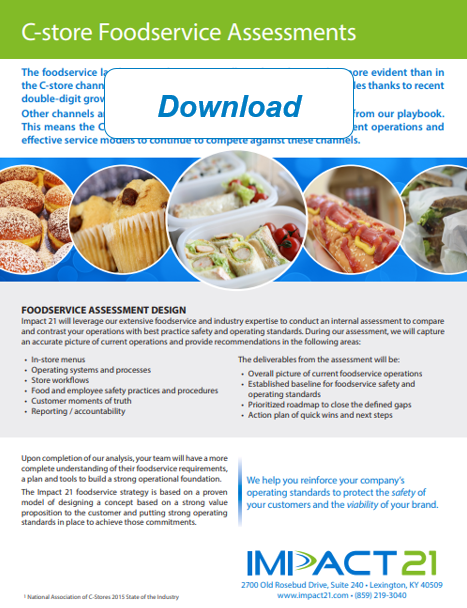 Impact 21 will help your team clarify your current foodservice vision and strategy, and gain stakeholder engagement required to take your food programs to the next level. Impact 21 takes an insight-based approach to foodservice concept development. 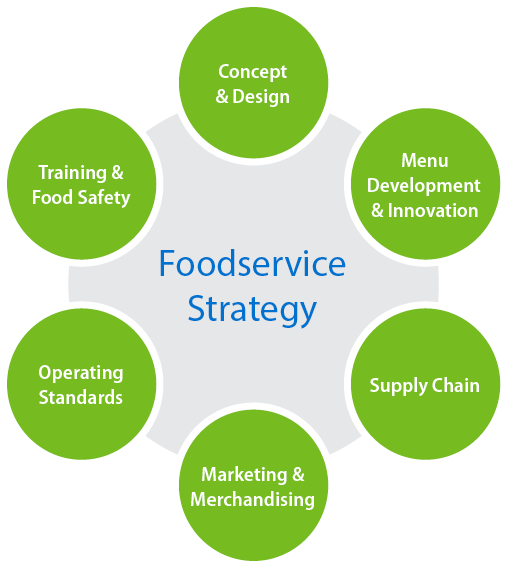 Comprehensive foodservice strategies are based on consumer trends and local market dynamics. These strategies are put into action with strong venues and sub-brands that drive consumer appeal. A solid operational plan links it all together and ensures execution, performance and profitability. A strong foodservice program needs to evolve to meet changing consumer tastes. Our menu innovation process balances best practices and consumer trends with the ability to execute and drive profitability. Our test-and-learn approach helps clients drive continued growth while keeping investment costs lower. Critical assessments of menu quality ensure that programs can meet customer expectation and be delivered consistently and profitably. We reset costs, retail prices, and rationalize menu items to drive profitability. 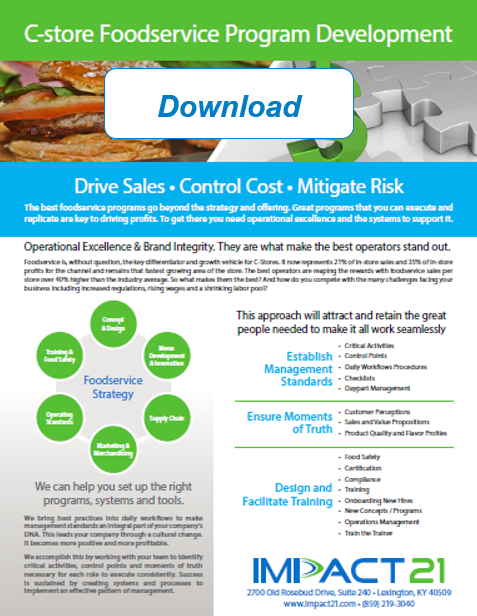 We take foodservice program development a step further to drive costs out of the system. We conduct a cost-benefit analysis to help you determine what combination of partnerships and self-distribution makes the most sense for each venue in your program. Conduct customer research to identify brand equities, customer value proposition, market positioning and potential offers as well as identify competitive strengths and weaknesses. Weave these learnings into customer engagement strategies to clearly tie back to your brand message. Bring it to life at the store level through effective packaging, product placement, and store layouts to generate engaging shopping experiences. Great programs that you can execute and replicate are key to driving profits. To get there you need operational excellence and the systems to support it. We implement a blend of daily and periodic best practice operating standards for each functional area of foodservice. Instill rigorous food safety practices across all programs. Capital investment budgets for foodservice programs. Actionable scorecards to monitor operational, safety, financial, and customer metrics.